Donating inherited property helps the charitable organization to which the donation is made, but it also helps the donor by creating a potentially substantial charitable contribution tax deduction. The extent of the available tax deduction to the donor depends in part on the donor's basis in the property, which is the value of the property for taxation purposes at the time that the property is inherited. The basis of most inherited property acquired from estates where a federal estate tax return must be filed is the fair market value of that property on the date of the decedent's death or on an alternative valuation date if the estate executor chooses to make the property valuations on a different date. For estates where a federal estate tax return is not necessary, the beneficiary's basis in the inherited property is the appraised value of that property on the date of the decedent's death. 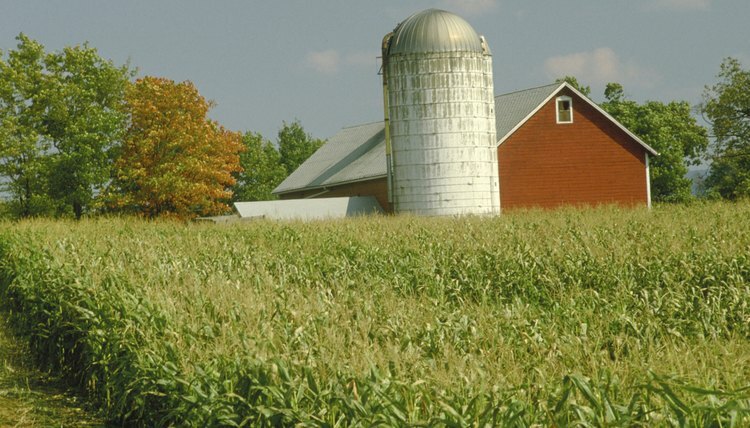 The basis of inherited farm assets can be valued differently than most general estate property. If the estate executor so elects, farm property can be valued at its use as a farm at the time of the decedent's death, rather than at fair market value of the property. This basis is increased by any appreciation in value between the time of the decedent's death and the time the property is distributed from the estate. Opting to use the special farm-use value rather than fair market value usually reduces the inherited farm asset basis. If a higher basis is more desirable to the heirs, for example if they wish to sell off the farm property for commercial development, the heirs may be responsible for payment of estate tax on that additional assessed value. An income tax deduction for a charitable contribution donation of appreciated assets is usually the fair market value of that asset less any appreciation or capital gain. This effectively returns the value of the charitable deduction to the basis at the time the property was acquired. For example, an heir who inherited real estate with a fair market value of $100,000 at the time of the decedent's death can then take a $100,000 charitable donation deduction for donating that real estate to a qualifying non-profit organization. If the value of that real estate has diminished since the basis was established, however, the donor can only claim a charitable donation in the amount of the fair market value at the time of donation. Charitable donation deductions are limited to a percentage of your annual adjusted gross income, although excess donation amounts can be carried over for up to 5 years in most cases. The laws regarding charitable donations and estate taxes change frequently. For example, property inherited from the estates of individuals who died in the year 2010 may be subject to a basis calculation that differs from the standard calculation applicable to estates of decedents who died in other years, according to IRS Publication 4895. Each state has its own additional regulations regarding taxation on estates and property transfers. Community property states have unique rules for the calculation of basis of property inherited from a spouse. It is always best to consult a qualified local tax professional to ensure that your donation of inherited property is conducted in the most economically efficient manner for the time and place in which you are making the donation. How Can the Executor of an Estate of a Life Tenant Allocate the Appreciation to the Beneficiaries? Life estates are often used in estate planning to help expedite the transfer of property between a decedent and his beneficiaries. Due to life estates' unique nature in regard to probate, people can be confused as to what role the executor plays in distributing the underlying property. The purpose of a life estate is to ensure that property is transferred without having to rely on probate. Therefore, the role of the executor is generally limited to ensuring the underlying property is quickly transferred to the next owner after the life tenant passes away. Any appreciation of the property during the tenant's life is transferred to the person receiving the property after the tenant's death. One of the greatest advantages in estate planning is that you’re the ultimate authority when it comes to deciding who gets your property -- and who pays inheritance tax on the transfers. In most states, inheritance tax isn’t an issue, but among those that do impose this sort of levy, the individual who receives the inheritance is responsible for paying it. This is different from an estate tax, which is levied against your estate based on the total value of all the property you owned. Inheritance taxes are based on the value of the gift. Can an Executor of a Will Be Responsible for the Deceased's Taxes? Everyone has the right to disburse their assets to whomever they wish when they make a will, but the Internal Revenue Service taxes that right. The executor of a will is not liable for paying the IRS personally, out of their own pocket. However, he is responsible for making sure that the IRS gets their money from the estate of the decedent, or the person who died.